After so many business acquisitions and mergers in the industry, looking for industrial brake rivets can be a frustrating experience. Look no further! 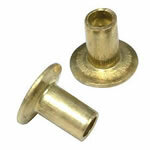 Duke Brakes carries a wide variety of replacement parts such as brake rivets. Navigate our brands for part numbers or contact us for immediate assistance. We will work with you to find the right fit for your brake product and ensure operational stability.